A collection of true-life encounters with the supernatural based on the first-hand experiences of everyday Australian women from all walks of life. 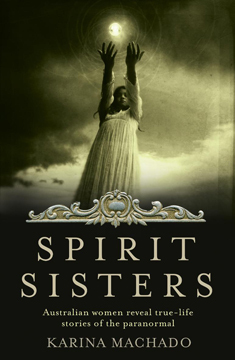 SPIRIT SISTERS was inspired by the scores of women who would preface their story with ‘I’ve hardly told anyone this, but…’. The journalist would scratch the surface and their story would tumble out; they’d given up the ghost, so to speak. 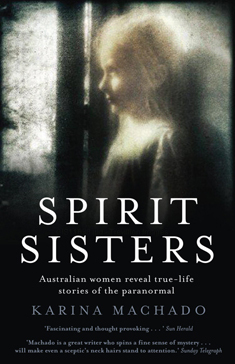 In SPIRIT SISTERS you’ll meet Australian women of all ages who share their very personal encounters with the supernatural. From a high-flying banking executive whose life changed for ever after a visit from a bizarre, winged entity, to a mother of seven who was held and soothed by her husband five days after she’d buried him, to the woman who lost most of her family in one car accident, this book is heart-breaking, inspiring, scary and comforting. In an age when psychics are called the new therapists and buying your own high-tech ghost-hunting equipment is just a click away on eBay, this book is a celebration of the one thing that hasn’t changed in hundreds of years. When a friend draws close, lowers her voice and begins to tell you her ghost story, as her eyes widen and her smile fades, as the very air around you seems to thicken and the back of your neck begins to tingle…isn’t it delicious? Do you enjoy a good ghost story? One that raises gooseflesh and makes your eyes grow large and bright? I do. I have always been fascinated by the spirit world, by the promise of what may lurk beyond the borders of our reality. As a small child, I was convinced I’d seen a ghost, a tall man in a uniform whom I promptly dubbed the Colonel. Seeing him was the first step on my path to writing Spirit Sisters. So you see, it’s been three decades coming! The vision (or was it a dream?) ignited a fascination already stoked by my mother’s tales of the mystical and melancholy city of my birth, Montevideo; a far, far away place full of the living phantoms of the family we’d left behind to start a new life in Australia. Every immigrant has a family of ghosts. In spirit, at least, I was ever by their sides, which I think made it all the easier for me to fathom an incorporeal dimension. Hints of this other world abound. Have you ever been sitting in a quiet house, reading your book and a breeze kisses your cheek, or a light touch lifts your hair? You might look around and think, ‘What was that?’ Listen to the language of your skin, my interviewees would advise. For your beloved dead have just called. I have spent a year speaking to women of all ages and all walks of life from all over our country about their paranormal experiences. The majority of them are not celebrated psychics; they are everyday women living anonymous lives, like your neighbour, your mother or your best friend. Yet, as they tend to jobs, children and partners, many of them live with an extraordinary secret: they can see the dead who wander their hallways. 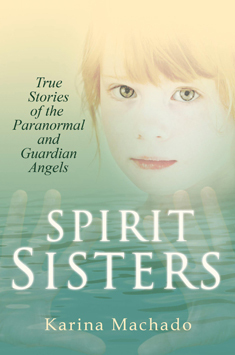 Spirit Sisters is a book about families, about life, love and the depths of sorrow. I don’t think I will ever be the same after meeting some of these amazing women. I hope that you too will be moved, uplifted, and yes, a little frightened. For above all, Spirit Sisters is about sharing stories, about celebrating that delicious moment when a friend leans in to whisper her ghost story and the hairs on your neck rise. After all, there is nothing better than a story.